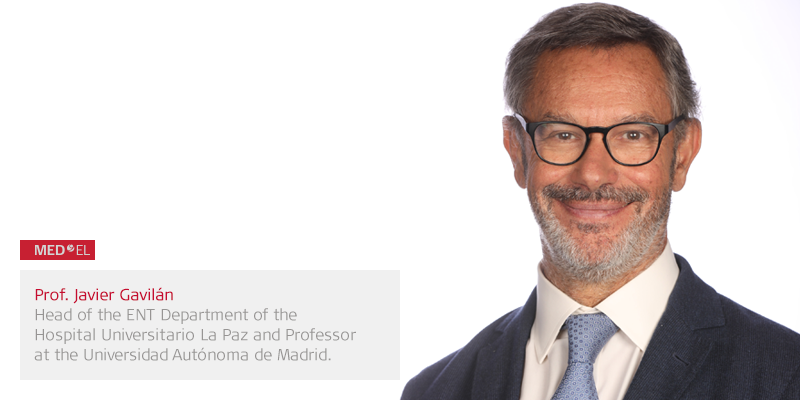 This week, we’re excited to share a very interesting guest contribution from Prof. Javier Gavilán, Head of the ENT Department of the Hospital Universitario La Paz and Professor at the Universidad Autónoma de Madrid. Recently, Prof. Gavilán and his team investigated a method for more accurately assessing the health of the auditory nerve intraoperatively. This can be particularly useful in cases of vestibular schwannoma resection or hypoplasia of the auditory nerve. Prof. Gavilán’s method utilizes an atraumatic intracochlear test electrode and eABR to physiologically assess the functionality of the auditory nerve. Let’s go over to Prof. Gavilán for a first-hand perspective of his research. In this study, my team investigated the usefulness of a minimally invasive intracochlear test electrode to assess the viability of the auditory nerve. Generally, severe-to-profound hearing loss has a cochlear origin, so evaluation of the functionality of the auditory nerve is not routinely needed. However, there are certain cases where the auditory nerve is present, but we need to evaluate its physiological properties. This can be cases where a tumor of the VIII nerve is extracted, such a vestibular schwannoma, and the nerve is preserved. Additionally, this can apply to cases where aplasia or hypoplasia of the auditory nerve is suspected, as imaging alone is not always enough to ensure the existence of a functional nerve. For these cases, we have developed a technique that allows us to test out whether the auditory nerve is still functional, to better predict the outcome of cochlear implantation. If we determine that the nerve is still functional, we can go for a cochlear implant. As a general rule, cochlear implant patients have better outcomes than auditory brainstem implant patients. In the cases where no auditory nerve response is found, an auditory brainstem implant may be a better option for that patient. 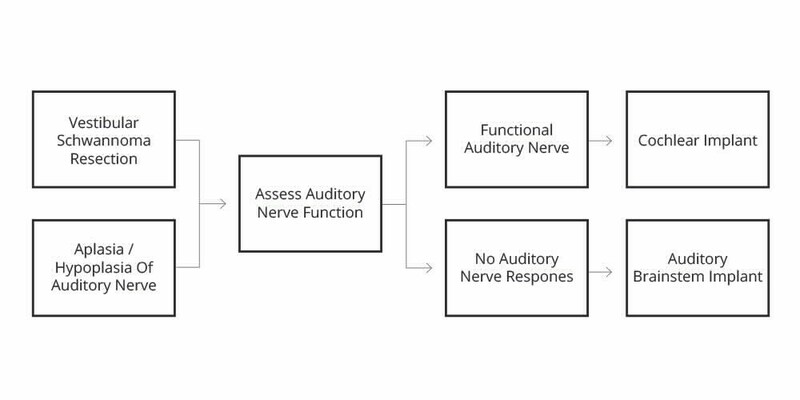 To more accurately assess the status of the auditory nerve, we developed a method using an intracochlear test electrode and electrical auditory brainstem response (eABR). The intracochlear test electrode is atraumatically inserted through the round window and electrical stimulation is generated by the MAX software interface to elicit eABR. Schematic and photo of test electrode. During the surgery the test electrode array is inserted into the cochlea. The second branch, a single leaflet electrode, is placed under the temporalis muscle. The test electrode can be connected directly to the MAX programming interface. Promontory stimulation can register false negatives and cannot be used intraoperatively. Interoperative auditory nerve monitoring can present signal artifacts and is limited by pre-operative high-frequency hearing loss. Electrode placement for auditory nerve compound action potential measurement can be technically challenging in cases of large tumors. Neural response telemetry recordings may not detect lesions of the nerve distal to the first neuron. In this study, we applied this technique in 10 patients already defined as candidates for a cochlear implant. These patients did not have tumors removed or auditory nerve deficiency, but we wanted to investigate the functionality of this special test electrode to measure eABR. We compared the effectiveness of this new test electrode and a standard electrode array in obtaining eABR. First, we inserted the atraumatic test electrode and measured eABR. Then, we inserted the standard electrode arrays and measured eABR. A total of 50 conditions were recorded for assessment. 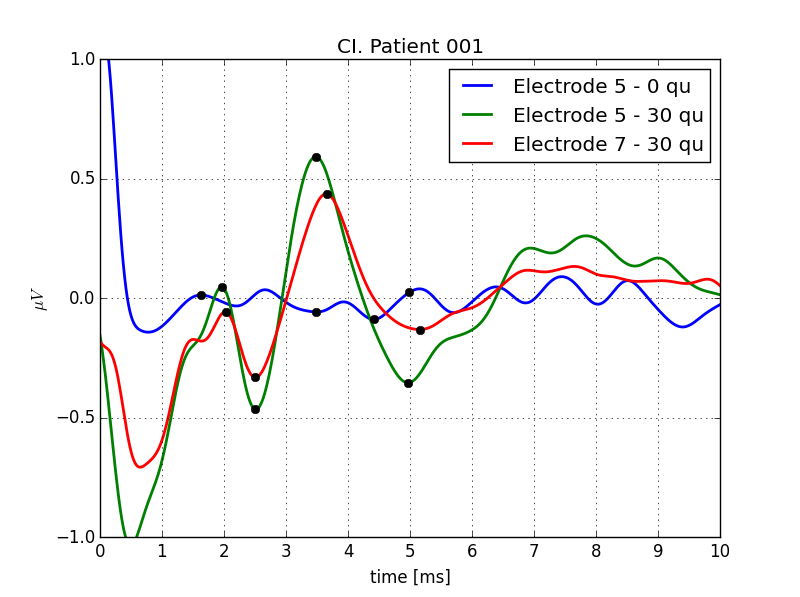 Responses to biphasic pulses applied with the test electrode in patient 001. There is a significant increase in amplitude in waves III-V, when higher charges are applied. Black dots indicate maxima/minima of waves III and V as detected by the algorithm. Result of eABR evoked with the standard electrode array in patient 001. Clear responses of waves III and V can be observed with a charge of 30 qu on electrodes 5 and 7. 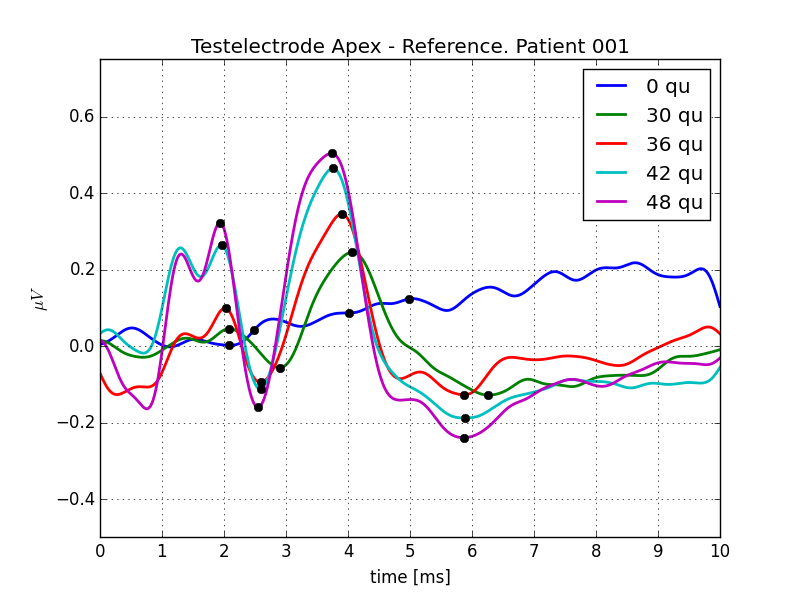 In all 10 patients, there was no statistical difference in latencies or amplitudes after stimulation with the test electrode and the standard electrode array. 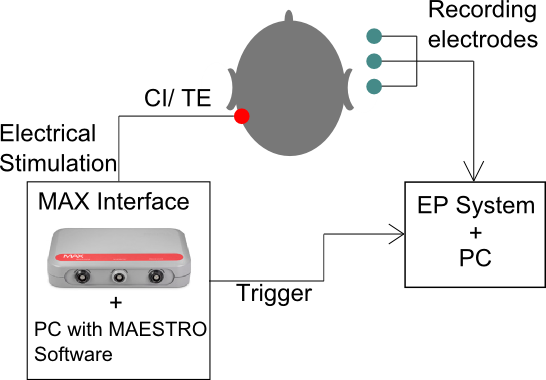 This demonstrates that the intracochlear test electrode may be a suitable method of testing the integrity of the auditory nerve by recording eABR signals. As expected, all 10 patients are performing well with their cochlear implant. Therefore, using an intracochlear test electrode and eABR can offer a more accurate assessment of the physiological function of the auditory nerve than other methods, such as promontory stimulation. Furthermore, the atraumatic intracochlear electrode allows for successful cochlear implantation following auditory nerve assessment. Thank you for sharing Prof. Gavilán, this auditory nerve assessment method appears to be very promising and we look forward to hearing more from you in the future. Usefulness of an intraoperative test electrode to predict the status of the cochlear nerve. Javier Gavilán, Miguel Díaz, Jan Huesers, Isabel Sánchez-Cuadrado, Miryam Calvino, Luis Lassaletta. We’ll be sharing more contributions from the field here on the MED-EL Professionals Blog—make sure to subscribe now!